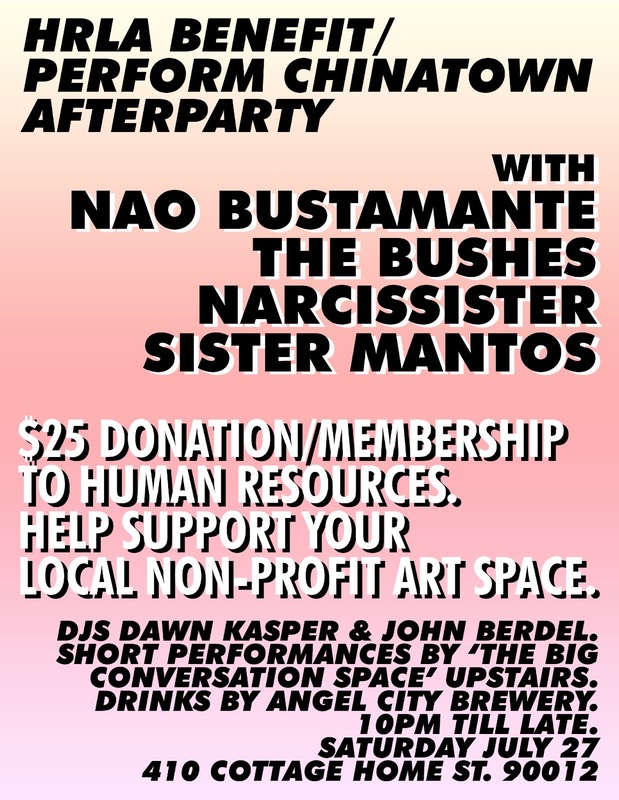 You are invited to Human Resources' Benefit Party. This event is free for members of HR. If you are not yet a member, a $25 donation gets you entrance and a membership! If you want to join now, go to humanresourcesla.com/support/ and make a donation today via our Paypal button. Every donation matters as an affirmation of the importance of HRLA's place in the community. The event starts at 10pm and follows the Perform Chinatown program on Chung King Road. Libations will be provided by HR and Angel City Brewery. Short performances by The Big Conversation Space with Clémence de Montgolfier and Niki Korth in the upstairs lounge. July 27, 2013, from 10pm till late.